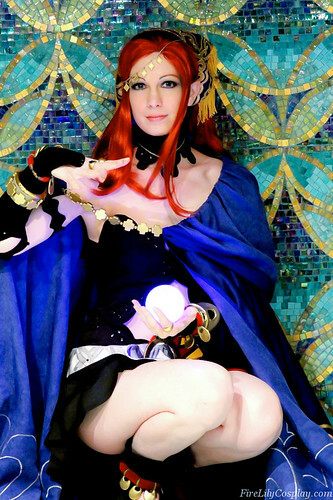 It’s our pleasure to have interviews with you – cosplay geniuses. Thanks so much for sharing us these useful tips and inspirations. Today, Fire Lily accepts our interview. To know more about her, stop here minutes please :D.
1. Since cosplay becomes more and more popular, how do you think about the good things and also bad things on this performance art? The bad things I see are increased negativity and the “celebrity” obsession streak that is running through the hobby currently. We’re nerds, and cosplayers only make up a very small part of Nerd Culture. People go to conventions mainly to see guests, watch anime and see exclusive previews, and buy merchandise, and cosplay really doesn’t return much of the investment that conventions spend to make the convention happen. We have to remember that we are a small niche, a small group of like-minded people, and despite being strewn across the country and across the world, we have to remain a tightly knit group. So all the negativity I’m seeing is really disappointing, especially when we should all be encouraging each other and building each other up through the sharing of knowledge and friendship. But the good things I see are more access to materials, costumes, prop makers, and commissioners that previously weren’t available, and I think it really helps everyone out there get a chance to have a really nice costume and to be able to cosplay what they want, instead of missing out on the hobby altogether. Cosplayers are also becoming more and more creative with how they craft their costumes and it’s a huge learning experience for everyone involved, because people are sharing their knowledge more and more so we can all benefit from their methods and experiences. I’m also really happy to see cosplayers becoming more ambitious with their costumes and props – I have seen some absolutely amazing costumes lately and whether they are handmade or not, I appreciate seeing such detailed and extravagant costumes out there. 2. 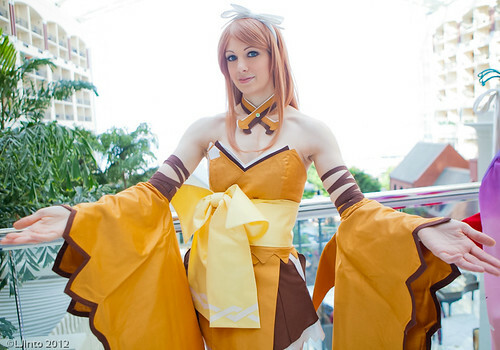 Do you consider yourself a “cosplayer” year round, or only when participating in certain activities? I am definitely a year round cosplayer. I am always making costumes or buying materials and wigs, and even making my own clothes or gifts for other people. Sewing is a huge part of my life and I honestly don’t know what I would be doing if I wasn’t sewing or crafting! 3. Going to a venue with many people to watch you in costume and simply taking a photograph, which one is more meaningful? It honestly doesn’t make much difference to me. I do enjoy showing off my work at conventions and getting pictures there, but I also love doing private shoots with my friends. On the one hand, convention photos aren’t always flattering and I have more control over posing during a private photoshoot. On the other hand, I love to get people’s reactions to my costume and it’s nice to have people appreciate my work in person. So, both are meaningful to me! 4. Is the creation of the costume or characters more valuable than the actual acting or vice versa, or is it a mix? As well, how much of the do-it-yourself mentality is admired? If someone just bought their whole costume, are they still a true cosplayer? I personally don’t like to call myself a “cosplayer” – I am definitely more of a “costume maker.” I don’t feel a need to “act” like my character, and I really prefer to just show off my costume making skills. But I think a lot of people like to act in costume and really get into character and that’s fine with me! There seems to be a pretty even division over the people who make their costumes and the people who buy their costumes. I feel that a costume is more impressive to me if I know the cosplayer made it on their own as opposed to buying it, but that’s because I am used to making everything by myself. If I didn’t have much skill or talent in sewing or crafting and I was only used to buying my costumes, I think I’d be impressed with all of it. So, I guess it just depends on your own perspective! I certainly don’t mind cosplayers having the option to buy pre-made costumes, especially if they don’t have the skills/time/money to make their own costumes. I do have to admit that making my own costumes is a huge money pit and not a lot of cosplayers out there have the funds available to make a costume. My only concern regarding pre-made, and even commissioned, costumes is when cosplayers claim the craftsmanship for their own or lie about the costume details, especially during competitions specifically for craftsmanship. So, as long as you are giving credit where it is due, I have no problem seeing a nicely-made, bought costume and calling it cosplay! After all, cosplay is really just about showing your love for a show or game, and it doesn’t really matter where you get the costume from in order to be a cosplayer. 5. 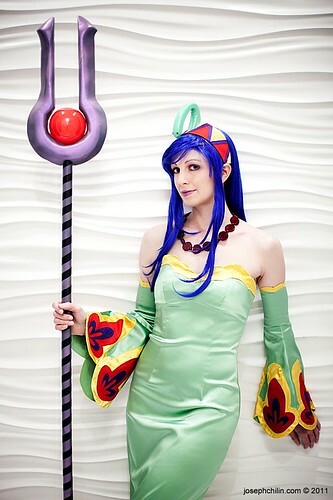 Do you have one piece of advice that you would give to cosplay virgins? Have fun. Don’t get bogged down with the negatives. It doesn’t matter what anyone else thinks of you or your costume as long as you are happy with it and having a great time in it. Take compliments with pride and ignore the rest, because you should not let those jealous and unhappy people bring you down if you are having a fun and fabulous time while cosplaying! 6. Which contest theme do you mostly want to see at Miccostumes.com? I would love to see a contest for partners in crime! Like Vash and Wolfwood from Trigun, Chrono and Rosette from Chrono Crusade, or any number of characters from Baccano, I’d love to see a theme centered around awesome duos who either fight crime or commit crimes!! The picture ideas alone are staggering. Cosplay Contests Sponsored by Mic Costumes – Spirit up in March!